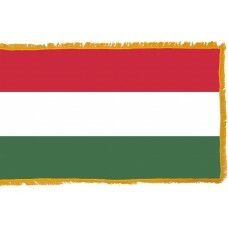 The Flag of Hungary consists of three colors which sit horizontally and are of equal size. The colors are red, white, and green. This has been the country's official flag since May 23rd, 1957 and was fully adopted on October 1st, 1957. The tricolor concept of the flag was based on the French flag reflecting ideas of the French revolution, whilst the red, white, and green colors are borrowed from the ancient Hungarian coat of arms. The stripes are horizontal in style to stop any confusion with Italy's flag of the same colors. There have been various attributes to the colors over time, including folklore listing red as a sign of strength, white being the faithful representative, and green being a color of hope. 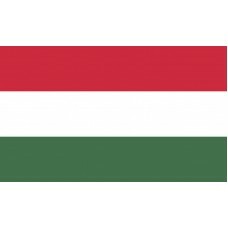 A second interpretation is that the red represents the blood spilled in the fatherland, with the white symbolizing freedom, and the green being symbolic of the pasture land in Hungary. The National Freedom Movement existed in Hungary before 1848 and the Hungarian revolution. At that time an independent republic was formed which was in opposition to the monarchy and in conflict with the Habsburg Empire. The period after this of 1848-1849 was a time of revolution with the Hasburg Empire (also known as The House of Austria), having control over Hungary and as a result, the Austrian Emperor banned the three-color flag. Eventually a compromise was reached in 1867 which legalized the flag allowing it to become the official flag of Hungary again but with some minor changes. The flag now bore a Minor Arms called the Kossuth Coat of Arms depicting archangel supporters which remained on the flag until the cessation of the Habsburg Empire in 1918. Turbulent years were to follow with many small changes on the flag, including a solid red banner which was used for just four and a half months in 1919, representing the Hungarian Soviet Republic. There was also a Coat of Arms with a Crown added for a short period which was replaced by a red star when the Communists ruled in 1949. A hammer and sickle were also added as part of a new coat of arms but after the anti-Soviet uprising in 1949 the hammer and sickle were cut from the flag leaving a hole to act as a symbol of the revolution. The Stalinist restoration followed and in 1957 were defeated by the Soviet Red Army. The new government designed a new coat of arms, which never officially made it on to the flag. As such, since 1957, the official flag has remained the pure red, white, green tricolor flag. Hungary is bordered by Austria, Romania, Croatia, Serbia, Slovakia, and the Ukraine. It is located in Central Europe and the capital city is Budapest. The language is known as Magyar, directly descended from the Huns dialect. There are two languages in Europe related to it, these are Finnish and Estonian. Heirs of Bendeguz, the knight. From King Matyas' dark array. Oâ€™er our heroes' captured swords!